What if... We rethink what we value in how we live, work and relate to one another? I imagine a world that calls for more humanness, as we free up time and energy to focus on what matters to us most and what we as humans do best. A Workable Future is my MFA Design thesis project, where I explored how future "work" might take form through directed and discursive research into technologies, trends, and design precedents. My MFA in Design helps develop my capability to better communicate results of research in emotionally compelling ways to fuel and inspire design and strategy. If digital footprints from our use of the internet today are new data we have not had before and they are already providing us with new human psychology and behavioral understanding, consider what it means as our digital and physical experiences become seamless in a phygital world. Beyond scrolls, clicks or searches from our digital devices, every action is potentially a new data point that could accumulate to provide new insights into our behaviors. With potentially new knowledge of humankind, how and where are we going to apply that new understanding? What data should be made sense of for the public good? Besides data saturation, automation is increasingly advancing too. While machines are going to replace part of what people do through artificial intelligence, they are also going to help people become better at what they do through intelligence augmentation. We are only in the early decades of the twenty-first century, and the world is already looking very different from the later years of the last century. Clearly, technology has had significant impact in the way we live, work and relate to one another. Why and how do we live differently from yesterday in this changing world? What mindset from the twentieth century calls for a reset? How might future “work” take form? What emerging new roles might there be? How might human-human, human-machine, machine-machine relationships look? In my thesis, I explored human-machine interactions in an emotion and behavioral data-rich world where automation is rapidly advancing. As automation becomes increasingly commonplace, I studied how this would impact the form of “work” in the future. Through 2D and 3D collages of existing artifacts today - images, objects, tools - I made artifacts for tomorrow, speculating a model of the way we could work and relate to one another. “Why do people behave the way they do, what are their motivations? How about when we start to look at a larger scale, at groups, communities, and societies? I have strived to keep up with global socio-cultural trends and technological advancements, and I am drawn to exploring their impact on the way we work and interact with one another. An illustration of where I began my thesis. I explored how I might develop values and design interventions through directed and discursive research into technologies, trends, and design precedents. I wanted to create narratives of potential futures, addressing their emerging possibilities while still placing them in historical and philosophical context. A Rationality Technician is skilled at interpreting quantifiedemotional data, and helps people develop better self-awareness in passing subjective, biased judgements. 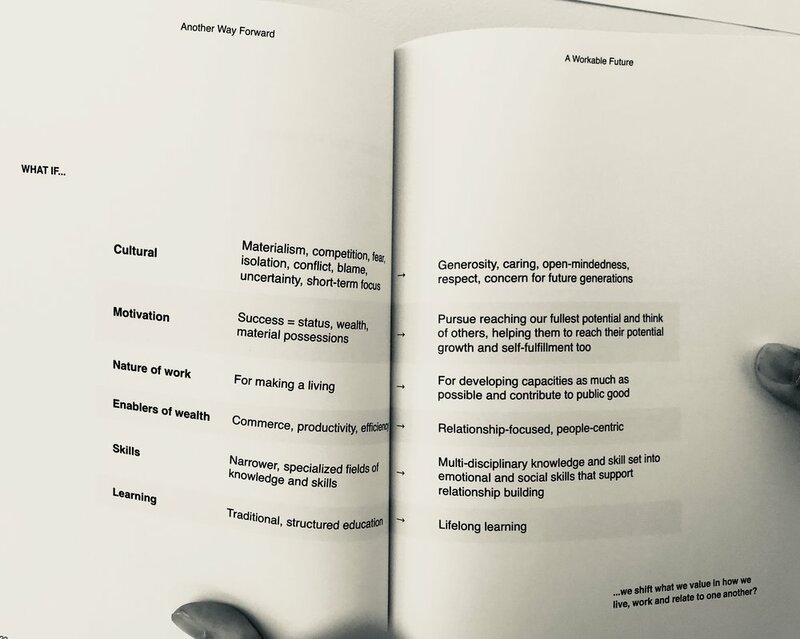 A Skill Set Transitionist is talented in recognizing and cultivating the potential in others, and helps people plan how they might build their skill sets to realize their passion, personal and professional aspirations as they transition from one role to another at different phases in life. A Sensory System Designer is an expert in using the senses of sound, vision and smell to improve the quality of experience of an environment, and helps people adjust between states of relaxation and stimulation for an improved state of wellbeing. The collection of values that we live out in our thinking and behavior are what contribute to the culture of a community. It is easy to criticize what is wrong around us, but we can only control change in ourselves. How we feel and think drive our behaviors. Developing our self-awareness can help us recognize how we might become better at putting space between our emotions and actions. With better self-awareness, we are able to recognize the narratives in our mind how they influence our treatment of others. I imagined a set of communication training tools that can help us better empathize and recognize moments we should extend our generosity in our interpretations of what others are trying to convey. We look at the world through our own perspective and interpret others’ intentions through our subjectivity. Tension in a relationship between two parties or individuals are more often than not, a build up of misconstrued intentions. Part of building good interpersonal relationships involves us extending the most generous interpretation possible to the intentions, words and actions of others. This is done by analyzing real-time micro-expressions, tonality and physiological characteristics, while taking into consideration of a person’s cultural influences. Visual prompts hint at when we should dig deeper in a conversation so we get a fuller picture of what another person is trying to convey. 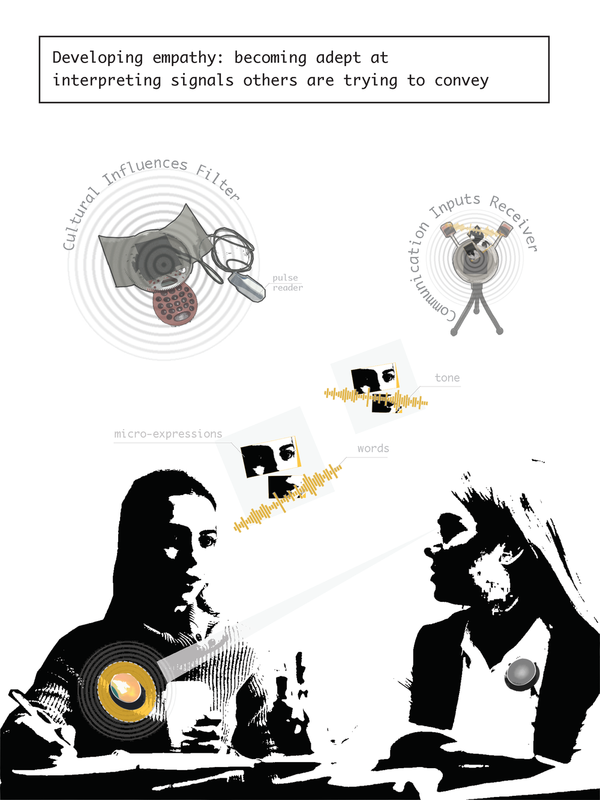 An emerging multi-discplinary industry around mood tuning: Further developments from the mood tuner was what gave rise to the idea of a new industry where the disciplines of sensory design, mood tuning, space and experience design, and mental health come together. This is based on the signal of growing professions with multidisciplinary backgrounds. Through 2D and 3D collages of existing artifacts today - images, objects, tools - I made artifacts for tomorrow, speculating a model of the way we could work and relate to one another. The design language of posters, collages and diagrams I have made gesture at past works from the 1960s and 1970s, such as those from Superstudio, Reyner Banham and Archigram. Besides sharing a common theme around human life, they share the same way of creating images by abstraction from popular and scientific magazines and re-connoted in a new context, manipulated, sometimes edited in chroma key.